With the assertion that the world must come together to show their commitment and resolve to fight the abuse and exploitation that millions of children face across the world, Honorary President of Global March and Nobel Peace Laureate, Kailash Satyarthi, organised the first ever ‘Laureates & Leaders for Children Summit’ in New Delhi on 10 & 11 December 2016. The Summit was held at the Rashtrapati Bhavan (the Presidential Palace of India) and was inaugurated by the Honorable President of India, Shri Pranab Mukherjee. In this unique and unprecedented gathering of 25 Nobel Laureates and Leaders from around the world, along with young leaders and 250 eminent personalities from differentwalks of life-academia, business, civil society, sports, media, arts and culture – the Summit was convened with one overarching goal-to build a strong moral platform for a child-friendly world by globalising compassion for ending child labour, slavery, trafficking and all forms of violence against children. The Summit, a brainchild of Mr.Satyarthi, was designed to tap into the enormous intellectual and moral power, experience, resilience and passion of the world’s established thought leaders to focus on the world’s most deprived children. The Summit was graced by some of the most influential people and global iconsof today such as: His Excellency Pranab Mukherjee – The President of India ; His Holiness the Dalai Lama – Nobel Peace Prize (1989); Her Serene Highness Princess Charlène of Monaco ; His Royal Highness Prince Ali Bin Al Hussein, The Hashemite Kingdom of Jordan, Director of the National Crisis Management Centre, Jordan and former candidate for FIFA President ; Her Royal Highness Princess Laurentien of the Kingdom of the Netherlands, Founder and Member of the Board, Missing Chapter Foundation ; His Excellency Lorena Castillo de Varela, First Lady of the Republic of Panama & UNAIDS Special Ambassador for AIDS in Latin America; His Excellency José Ramos-Horta – President of Timor-Leste (2007-2012) - Nobel Peace Prize (1996); The International Labour Organization which won the Nobel Peace Prize in 1969 – represented by His Excellency Gilbert F. Houngbo - Deputy Director-General for Field Operations and Partnerships, ILO & Prime Minister of Togo (2008 to 2012); Her Excellency Julia Gillard - Prime Minister of Australia (2010-2013); Mdm. LeymahGbowee – Nobel Peace Prize (2011); Mdm. Tawakkol Karman - Nobel Peace Prize (2011); Mr. Kailash Satyarthi – Nobel Peace Prize (2014); All members of the National Dialogue Quartet of Tunisia which won the Nobel Peace Prize in 2015: Mr.HassineAbassi – General Union of Tunisian Workers (UGTT) , Mdm. Ouided Bouchamaoui, President of The Tunisian Confederation of Industry, Trade and Handicrafts (UTICA) , Mr. Ameur Meherzi, Dean, National Order of Tunisian Lawyers , Mr. Jamel M’sallem, Tunisian Human Rights League (LTDH); Mr. Angel Gurría, Secretary-General, Organisation of Economic Co-operation and Development (OECD) ; Mdm. Kerry Kennedy, President, Robert F. Kennedy Human Rights. With our specialised knowledge and technical expertise on the issue of child labour, slavery, trafficking and education, Global March played a critical role in planning out the structureand broad agenda of the Summit and supported our partner organisations, the Kailash Satyarthi Children’s Foundation and Bachpan Bachao Andolan in building content and technical sight of the plenaries and special sessions such as ‘Circles of Freedom: Lend Voices to Our Children’, a series of 23 simultaneous round table discussions presided by a Nobel Laureate and a world leader, focussing on themes ranging from access to justice, role of business and youth, tapping innovation and technology, creating child friendly communities, and a coordinated , holistic approach to end child exploitation. Global March’s holistic approach of collaborative action and cross-sectoral representation of trade unions, child rights organisations and teachers’ associations across the world, supported in expanding the reach of the Summit, and in garnering worldwide support for this noble initiative through its partners, Regional Coordinators and Board Members. 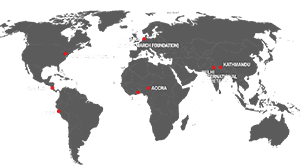 Global March through its wide network of partners in Africa, Asia, Europe and Americas also facilitated the participation of Youth Delegates at the Summit from countries such as Togo, Ghana, Chile, Bangladesh and Philippines. These Youth Leaders are the champions of child rights in their countries and regions and are one of the foremost voices for the eradication of child labour, slavery and trafficking. The idea of youth participation at the Summit came from one principle that children and youth are the change makers and leaders of tomorrow. Therefore, their presence and facilitation of their interaction, with the world’s most influential people was inevitable. These youth leaders were especially engaged at the interactive Townhall Session“Building Collective Wisdom With Our Youth and Children”, held with the Nobel Laureates, World Leaders and others present, which further helped in soliciting their inputs towards the Outcome Document. Global March thus recognises this power of the youth and seeks to engage them more constructively for a long-term impact, resulting in the eradication of violence against children and promotion of children’s human rights. While Global March engaged youth on one hand, it also brought in some of the most important voices that has the power to change the face of legislations, policies and programmes for children- the Parliamentarians. Through our initiative ‘Parliamentarians Without Borders for Children’s Rights’, Global March ensured the participation of several Members of Parliament from different countries of the world such as Bangladesh, Sri Lanka, India, Nepal and Ghana. The participation of Parliamentarians at the Summit helped them to enhance their knowledge on the issues of child rights and strengthened their commitment to work for children nationally and globally. The Laureates and Leaders for Children Summit concluded with signing of an Outcome Document or a Declaration called Will For Children and culminated into a march of almost 10,000 children and young people, led by the Laureates & Leaders from the Rashtrapati Bhavan to India Gate, which marked the launch of the historical 100 Million for 100 Million campaign. This5 year campaign will address extreme poverty faced by millions of children around the world, and empower youth to make difference to their lives and ensure every child is free, safe and educated, and has a chance in life. For this campaign, 9 Global March partners from 8 countries (Argentina, Bangladesh, Chile, India, Japan, Nepal, Peru and Togo) will be taking the lead and will become torch bearers bringing their rich experience of many decades for the success of the campaign and contribute to making a child friendly world. This Summit thus marks an important benchmark for the international community to pay attention to the world’s most vulnerable children and gives impetus to the implementation of the child-related Sustainable Development Goals, especially on ending child labour, slavery, trafficking and all forms of violence against children, continues to be one of the most important objectives of Global March and its partners.